Studio cottage w/ kitchenette on beautiful 10 Acre Vineyard Property! Come stay in the middle of the Paso Robles wine country and enjoy the peace and relaxation in a quaint cottage that takes advantage of views and the lifestyle of the Paso wine region. The studio has a queen bed, a pull out couch, table and chairs, kitchenette, new bath, BBQ and private sitting area in front of cottage! The property is a working vineyard containing 8 acres of mature Grenache and Mourvedre vines. All grapes are currently supplied to Tablas Creek for inclusion in their Patelin line and recently won Double Gold for the Grenache Rose. Tablas Creek was recently ranked #1 winery in the country. Please note that Hollyhock Vineyard is a working vineyard, and we are surrounded by farms. While the unit is thoroughly cleaned after each guest, unfortunately that does not always keep all the dust and bugs from getting in. It is also possible you might hear rural sounds such as tractors, pigs, goats, horses, cats, dogs, frogs, owls, bugs, and other animals during your stay. For these reasons, this property is not like staying at a hotel, but we hope this adds to the charm of vineyard living for our guests. There is a main Farm House and another studio cottage on the property listed with VRBO as well (#784836, #686401). Feel free to book all three listings for a family or group getaway and have the whole vineyard to yourself! There is a community Bocce Ball Court that is shared with the other two cottages, ample parking, and you are welcome to peruse the vineyards. At the top of the hill is a bench and a great spot to open a bottle of wine and enjoy the views. Feel free to pick from the many fruit, olive, almond, and walnut trees on the property. Well behaved dogs are welcome with a $25 pet fee per stay. If you leave your pup at home please ensure they are kenneled. The vineyard is a great spot for dog walks and is completely fenced in if you would like to let the pup roam. However, if there are dogs staying in one of the other cottages please respect the local leash laws. Please no pets on the furniture or beds. Within a few miles are many of the best wineries in the country. Victor Hugo's Winery is across the street if you are looking for a winery within walking distance. There are several others within biking distance as well. Of course we highly recommend the drive to Tablas Creek to sample wine from our vineyard! Please see the guidebook for more recommendations! Downtown Paso Robles has fantastic restaurants, tasting rooms, and shops. Our favorite spots include Artisan, Thomas Hill Organics, Il Cortile, Buona Tavola, and the Pony Club bar. If you like beer, make sure to check out Firestone Brewing, Barrel House Brewing, and The Pour House. Downtown Templeton is a cozy farm town and has a great steakhouse called McPhees, and a lively wine bar called 15 degrees. Necessities and groceries can be found off of Niblick Road, less than 5 miles away: Albertsons, Walmart, CVS, Kohl's, Starbucks, Chase Bank, Chevron, and more. Biking: If you are looking to get some exercise and enjoy the scenery you can ride your bike to many of the local wineries. Leave your wine purchases at the wineries and pick them up another time with your car. Walking: you can step out our gate and meander around the neighborhood easily. Olive trees on one side and goat cheese producer on another. Convenient to all yet rural feel. Uber and UberWINE: Yes Uber is here... and they now have a wine tasting service too! Fetch: Will pick up dinner, groceries, beverages and will deliver to you. Hours 11 a.m to 2 a.m.
Julie is originally from the Bay Area CA and Bill is from New England. After owning (and renting) a beach cottage in Kennebunkport Maine for the past seven years and recently having a baby girl we decided that it was finally time to get a vacation place a little closer to our home in the Bay Area. We asked ourselves, why choose another beach home when we have such amazing vineyards here? We purchased Hollyhock Vineyard in late 2015 and are excited to continue the high level of service set by the previous owners Lisa and Philip. Bill works in high technology and travels the USA to visit customers (and is now a part time farmer and vineyard manager). Julie is a middle school counselor (and part time rental property manager). We love visiting Hollyhock Vineyard with our family and Golden Retriever Cappy. Cappy is the happiest pup in the world when he gets to race around the 8 acre property and say hello to the neighboring goats, horses, and the ground squirrels he can never seem to catch. Large bath with even larger closet, high ceilings! Located in center of an active vineyard. Views of both mountains as well as rows of vineyard, windmill, barn and more. Electric heater. Also heater in bathroom if necessary! Studio has couch, end table, coffee table for comfort. Ceiling fan in studio; even games for a rainy day! No stove but hot plate with pots/pans for preparing basic foods to complement a BBQ or for cooking up some breakfast foods! filters provided. We also have a Nespresso and a starter set of pods. Bring your own if you love Nespresso! Seating area with table overlooking your patio area located in studio; BBQ grill is available as well with picnic bench. Box games for a rainy day (in Ca?) Even have a bocce ball court for an afternoon game! This property has been updated with a large bath and sitting area. Unique in that you are right in the center of a working vineyard; very tranquil and private. Even has BBQ. Best suited for a couple. Comfortably decorated and equipped. This cottage was all we were hoping for - beautiful, peaceful, and quite comfortable. It was so nice to walk the vineyard, with unbelievable views. Highly recommended and we hope to be back soon! My wife and I arrived on June 18th to celebrate our 34th wedding anniversary for 3 nights. Google maps got us close to the place, but we were able to find it thanks to Bill and Julie's direction. It was still light out when we got there, but once you enter the property, there are well lit signs to guide you to the cottage if arriving after dark. It is a clean, cozy little cottage. Nice bathroom, large walk in closet, no stove in the kitchen, but the BBQ, hot plate and microwave were more than enough to cook our meals. It was very clean and the bed was very comfortable. No TV, which was nice. 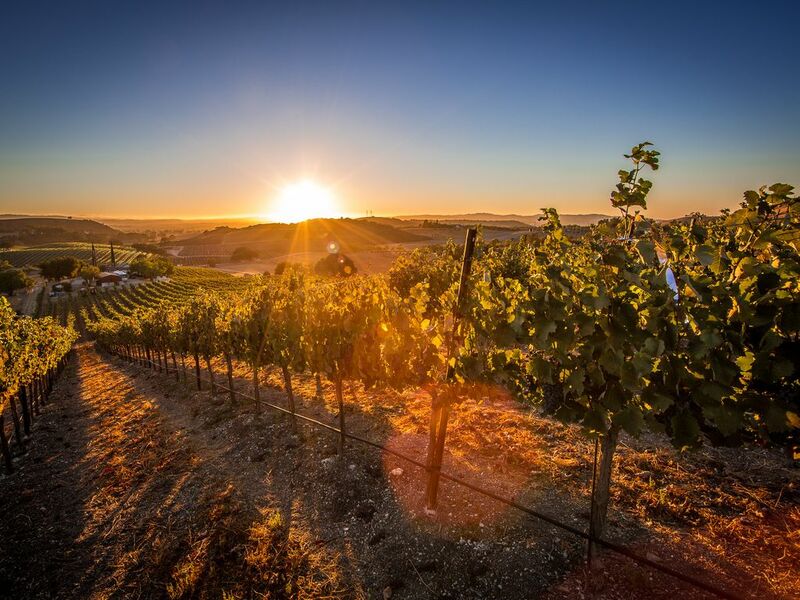 Paso Robles is not far away and of course has a lot of great wineries. The property is so tranquil and relaxing, we almost didn't want to go anywhere. We would definitely stay here again and recommend it to everyone. Thank You Bill and Julie! Great place to stay-- thank you!!! Very clean cottage with scenic views. Convenient location to the wineries and to downtown Paso Robles. Owner's description and photos accurately depict the property. Julie and Bill were quick to respond to any questions we had. We definitely plan to go back and would definitely rent again!! Enjoyed a large family gathering to celebrate a Cal Poly Graduation. Rented all three properties and couldn't have been more impressed. Great weekend. Great little cottage tucked in the Templeton Gap section of Paso Robles wine country. It was relatively private and perfect for a weekend getaway. Templeton is located right next to the Paso Robles wine region..and we too are grape growers for a popular local wine maker. There are wineries that surround us for you to visit and then you can come back to the cottage for peace and quiet along with amazing views. Minimum 2 nite stay. Note that during these special events I require a 3 nite stay minimum: Zin Fest weekend in Feb, Wine Festival in May, Memorial Day, 4th of July, Labor Day, Thanksgiving and Christmas.